Located only 3.5 km from the small city of character Nanteuil-en-Vallée, nicknamed the "little Switzerland Charentaise", this charming house with all comfort with garden, offers the ideal setting for lovers of peace and the countryside. The house of 137m2 offers a large living room, a large kitchen, 3 bedrooms (one with shower and toilet), a bathroom, separate toilet. Upstairs, second living room with fireplace and balcony to enjoy the serenity of the surrounding environment. This is a very charming property full of character. We spent two weeks at this property and found it very comfortable. Weather was very warm so plenty of shade outside if needed. The village 3km away has a lovely restaurant and shop. Valerie and Gordon were only a phone call away to help with any questions we had and left a lot on information at the house on places to visit. I would recommend this property if you are looking for peace and quiet with not far to travel for something more lively. Thank you very much Lorraine and Uwe for your nice comment. It will be a pleasure to welcome you again in our house in the future. Wonderful house in beautiful surroundings. Really well equipped house with lovely gardens in a beautiful area. Lots of space inside and out. Had a great time exploring the area. Lovely to eat outside every evenimg. The owner Valerie was very helpful. We hope to stay again soon. Highly recommended. Thank you very much Emma for your kind words. We will be very happy to welcome you back any time. Nous sommes très contents de la maison. C'est très comfortable et nette. Nanteuil est beau. Des grandes villes comme Angoulême et Limoges sont un peu trop loin, Enfinc'est campagnard. Nous sommes ravis que votre séjour dans notre maison vous ait plu. Au plaisir de vous accueillir à nouveau dans le calme de notre campagne charentaise. Valérie. Nous avons beaucoup aimé ce séjour dans cette très jolie maison ,cachée dans un joli hameau de la campagne charentaise . La maison est très jolie et très agréable à vivre ,très bien équipée. Vous pouvez vous poser en arrivant,sans courir immédiatement aux courses ! Nous avons vraiment aimé ! The village of Nanteuil-en-Vallée near the property (2.5 km) is a small town of character located in a pleasant natural setting and crossed by a river beautifully named Argentor. Ideal setting for the walk and the relaxation, its former wash-house and its abbey will attract the curious ones of history. The taste buds of vacationers should find satisfaction at the table of two excellent restaurants. Other shops in the village: bar, multi-service grocery store, pizzeria, hairdressers, butcher and pharmacy. The city of Ruffec (12 km) offers all the facilities of an average city: 3 supermarkets, banking services, indoor pool, cinema, restaurants, fast food (McD's) and tourist office. Markets on Wednesday and Saturday morning. 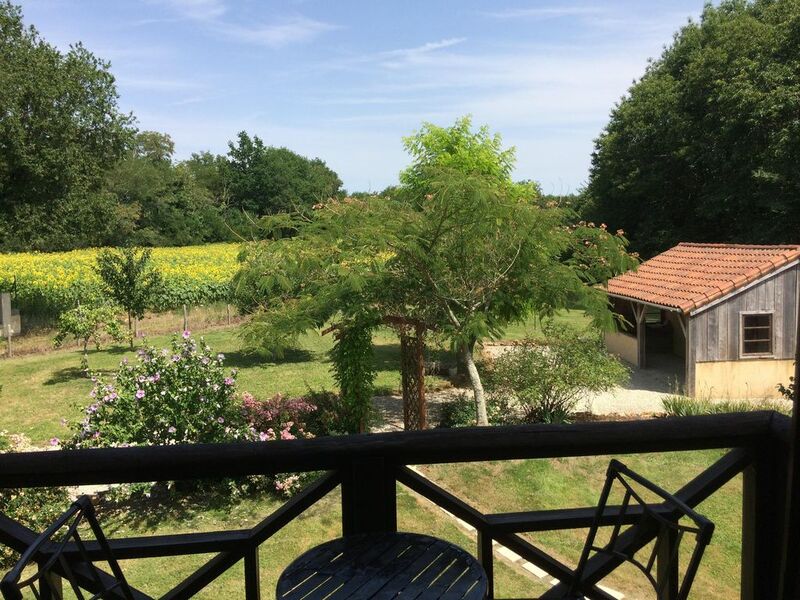 The leisure center of Rejallant (11km) is ideal for swimming and water activities: possibility of renting canoes / kayaks for a bucolic and refreshing navigation on the Charente. Champagne Mouton, the medieval city of Verteuil-sur-Charente and Civray will awaken the curiosity of visitors.